Aids are physical pressures a rider uses to communicate with the horse. When the horse responds correctly to the pressure, the pressure goes away. So a correct response rewards the horse. Think of individual aid pressures as “words” that have a specific meaning to the horse: change gait, go left, go right. As both horses and riders progress in their training, they begin combining several aids into “sentences” with greater nuances of meaning than a single word: get ready for an extended trot after we make this left turn, spin to the left when you come to the end of this slide. Aids are not the same as cues. The horse responds to voice commands or to a click that means trot, or a bump that means canter is responding to conditioned cues. This is a different communication system and there’s absolutely nothing wrong with it. The problem is that riders communicating with their horses via cues are working with a very limited vocabulary. Riders communicating via the aids have a full, rich vocabulary with many shades of meaning. 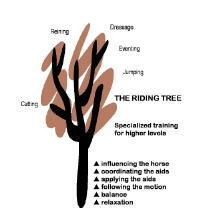 In order to take a horse to the upper levels in any sport, you need this larger vocabulary. The “natural aids” consist of the legs, the seat or weight aids, and the hands or rein aids. We put these aids together into corridors of pressures that the horse feels as a shape we want him to take. Because, we can vary the pressure of any aid, good riders can apply them with great finesse or shades of meaning to communicate hundreds of variations of shape to the horse. Leg aids are used primarily as driving aids that ask the horse to move a hind leg forward. A rider puts a leg aid on the horse by pressing with the inside of the lower leg (with the toe pointing forward, not out). Leg aids can be applied with varying degrees of pressure and in different sequences to ask for specific shapes. When both legs actively apply driving pressure, we call that a bilateral leg aid. Some examples would be asking the horse to move from a halt to a walk or from a walk to a trot. When only one leg is actively pressing and asking the horse to move the hind leg on that side forward while the other just softly holds and steadies, we call it a unilateral leg aid. Some examples would be asking the horse to turn while in motion or to pick up a canter depart. Weight aids are the second category of aids we have to use as communication tools. We talk about burdening weight aids where the rider drops more weight onto her seat bones and makes her seat feel heavier to the horse. The opposite of that is unburdening or decreasing the weight on your seat bones and making your weight lighter in the saddle. Like leg aids, weight aids can be applied bilaterally or unilaterally. It’s important to understand that when the amount of weight carried on a particular seat bone changes, the rider’s upper body position should not change. The upper body should not lean. The hip should not collapse. The rider simply drops a little more weight into one or both seat bones. Weight aids are particularly effective because when you are balanced over the horse’s center of gravity and following its motion, any weight shift creates a physical pressure that causes a feeling in the horse that he needs to rebalance himself. They naturally influence the horse to take the shape you want. For example, to turn the horse to the left, you simply sit a little heavier on your left seat bone and the horse automatically feels like stepping to the left to keep you centered over his center of gravity. A keeping rein maintains steady, elastic contact with the bit while following the horse’s motion. Riders cannot effectively use a keeping rein until they are relaxed, balanced, and able to follow the horse’s motion with their seat. A taking rein means that the little finger moves the rein slightly toward the body. Many riders incorrectly take rein by bending their wrists. However, if you bend at the wrist in order to “take rein”, you lose the elastic connection to the elbow which is the essential joint to absorb motion as your hands follow the horse’s motion. A “take” is usually followed by a “give” or soft release. Examples of a bilateral taking rein include the rein back and the half halt. A giving rein is applied by moving the little finger slightly away from the body. The giving rein aid always follows the taking rein aid. On a circle, for example, the rider rhythmically applies an inside taking rein followed by an inside giving rein to position the horse’s head slightly to the inside of the circle. Meanwhile, a steady outside keeping rein follows the shape you want the horse to take and allows the degree of bend you want. A resisting rein is a taking rein that is not followed by a give or release. A bilateral resisting rein applied for a few strides asks the horse to make a downward transition or to stop. In addition to these three natural aids, we also have the artificial aids of the whip, spurs, and voice. The voice is often used more as a cue than as an aid with shades of meaning. Whips and spurs are very misunderstood inside and outside the horse industry. When they are used to reinforce the driving leg aids, there is nothing innately abusive about them. They simply become another shade of meaning. In that regard, the timing of their use is critical. In training, we take a horse through the steps of showing him what we want, then asking him for what we want. Once he has mastered those two phases, we can use our natural aids to tell him what we want. When we know that the horse understands what we are telling him but the horse chooses to ignore the request, this is the appropriate moment in time to reinforce your natural leg aid with a tap of the whip or a touch of the spur. Either should be applied with a degree of pressure that does not startle the horse or raise his excitement level. Used this way, whips or spurs are not seen by the horse as a punishment. They are simply another shade of meaning added to the pressures they already understand so they are going to be horse logical. We use corridors of aid pressures to create the feeling of shapes we want our horse to take. However, it is important to understand that a constant pressure goes away. A good example is the pressure of the girth. Initially, a young horse may be very apprehensive about the pressure of the girth. However, because it never changes, he starts to ignore it. The same can be true of any of our natural aids. If a rider inadvertently applies constant pressure with a leg or weight or rein aid because she is out of balance or unable to control her body’s movement in some way, the horse soon learns to ignore the pressure. That is why development of an independent seat through relaxation, balance and an ability to follow the horse’s motion is critical to proper application of the aids.